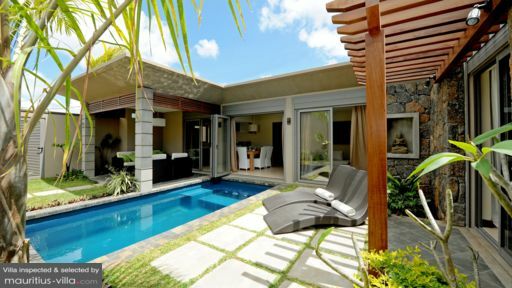 Found not far from one of the most pristine beaches in Mauritius, Athena Villa 2 offers privacy, luxury and- more importantly- an oasis that was entirely crafted for rest and relaxation. The perfect haven where you can leave all your everyday issues at the door, Athena Villa 2 is equipped with two bedrooms, a wide tropical garden, a swimming pool, terrace and spacious living areas. Best of all, this villa also includes complimentary and paid services that will help make your holiday even more memorable. Athena Villa 2 can sleep up to 5 people. It has one large Master Bedroom which comes with a double bed, complete with an orthopedic mattress. This bedroom also includes the dressing area, with a safe where you can store your valuables during the duration of your holiday. Fully air-conditioned, the master bedroom additionally includes an en-suite bathroom with His and Hers sinks, shower and toilet. Unlike the guest bedroom, the Master Bedroom overlooks the garden and opens on the villa’s swimming pool. If you’re planning a family holiday, you will be glad to learn that Athena Villa 2 also has a guest bedroom for the kids, with a double bed. Like the master bedroom, it is also air-conditioned and includes a dresser and a fully-equipped en-suite bathroom. This room opens on the villa’s main living area. To cool off after a warm day of exploring the island, you can take a soothing dip in Athena Villa’s deep blue plunge pool. Offering the perfect refreshment for these balmy summer evenings, the pool is found in the impressively green garden that has been especially conceived to create the perfect oasis of peace and tranquility. With lush palm trees and leaves that sway gently under the tropical breeze, the outdoors area is also punctuated by comfortable wicker furniture where you can just put your feet up and relax. With barbecue equipment and facilities, the garden also includes sun beds. Elegant, contemporary and- above all- supremely comfortable is what makes up Athena Villa 2’s interior. Its wide and airy living room houses an L-shaped sofa and a flat screen television. The dining area can easily seat eight people, which is idea if you’re planning on having guests over. As far as the kitchen is concerned, rest assured that you will be able to benefit from all the facilities and utensils to whip up your own treats anytime you want. The fully-equipped kitchen overlooks an expanse of lush greenery, enabling the glorious scents of tropical plants to infuse the kitchen at night. 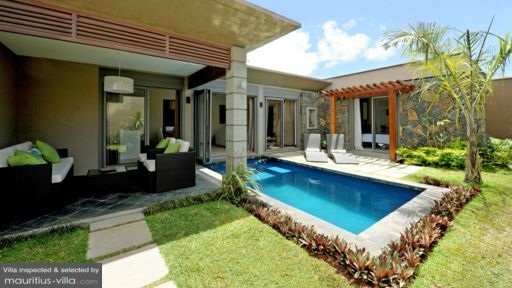 A complimentary maid service is offered with your booking to take care of the maintenance and cleaning-up of the villa. For an additional fee, the maid can also take care of the cooking. Or, if you want to enjoy a real culinary treat, you can also book Athena Villa’s professional cook who will undoubtedly charm your palette with tailor-made gourmet meals that will please just about anyone. A continental breakfast is also offered every morning. This includes coffee, tea, pastries, jam, bread, butter and fruit juice. As a supplement, you can also order sausages, bacon and eggs. 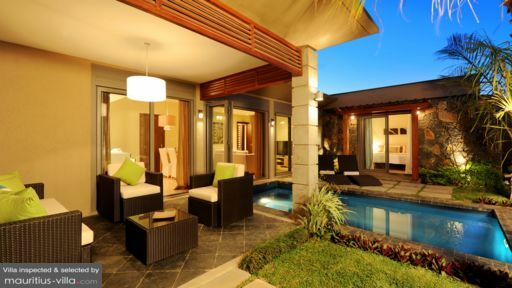 The villa also benefits from free, around-the-clock security services as well as a 24/24 concierge service. Other services can be booked at an extra fee and these include your airport transfer, vehicle rental, grocery delivery and baby-sitting. As a guest of Athena Villa 2, you have exclusive access to La Plage, a stunning stretch of beach found around fifteen to twenty minutes from the villa. You can lie in front of the azure ocean and forget your worries as you soak in the gloriously warm tropical sun. If you’re in the mood for some much-needed pampering, you can also check out the Domaine des Alizees Club & Spa, which is virtually next door to the villa. This spa offers an A La Carte Menu as well as tailor-made treatments to help you with specific problem areas. Of course, no holiday is complete without some good food! Head over to Hong Kong Palace, one of the region’s better-known Asian restaurant that specializes in Chinese delicacies such as Peking Duck and dumplings. Hong Kong Palace is found in La Croisette Mall, which is around twenty minutes away from the villa. Other nearby attractions include the Aquarium, Banana Beach Bar and the highly-reputed Casino de Maurice.